Offering you a complete choice of products which include low level laser therapy device and wrist laser therapy device. 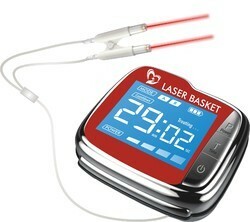 Laser therapy device ( Wrist Laser Therapy Device) control cholesterol level through its laser beem. Which may also help to take care of your heart. Its a small and handy product which you have to wear on left front wrist for 30 minutes twice a day. Suitable for man and women both. Looking for LASER HEMOTHERAPY DEVICE ?